Is Steak au Poivre still a thing? I don’t think I’ve seen it on a menu in decades. I certainly haven’t eaten it in an awfully long time. I think I’ve probably cooked it, but not in living memory. I don’t even know if I particularly like it. It’s steak. With peppercorns. That must be good, right? So, let’s make some steak. 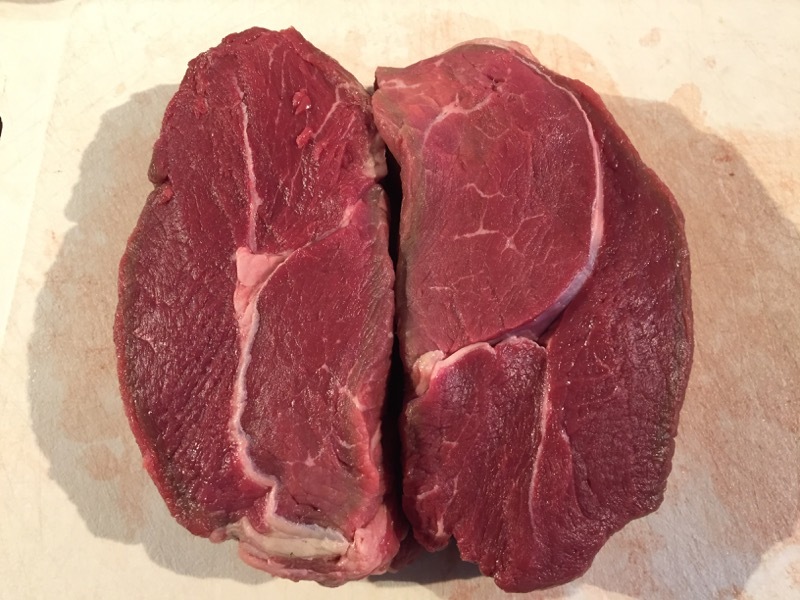 It all starts with a couple of pieces of thickly cut rump steak. 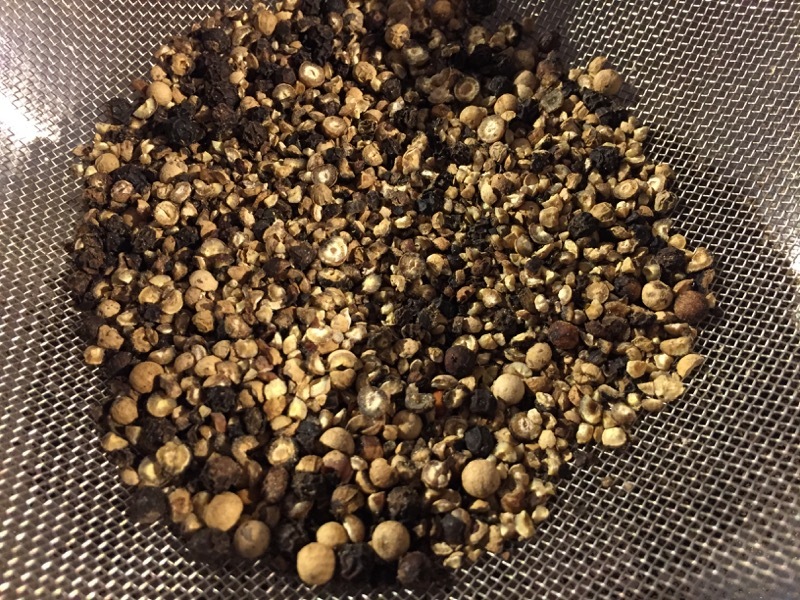 Next, I coarsely grind up a mixture of black and white peppercorns, and then sieve that to remove any dust (otherwise, the steaks will be too hot, apparently). 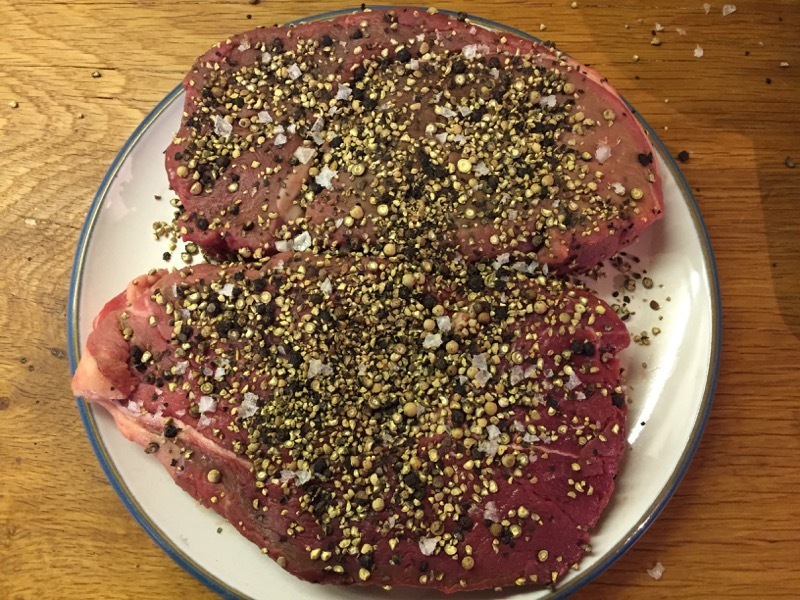 I press the pepper into the sides of the steaks, followed by a little salt. And then cook them in a hot cast-iron pan. Once they’re almost done, I add some butter and baste the steaks with it. 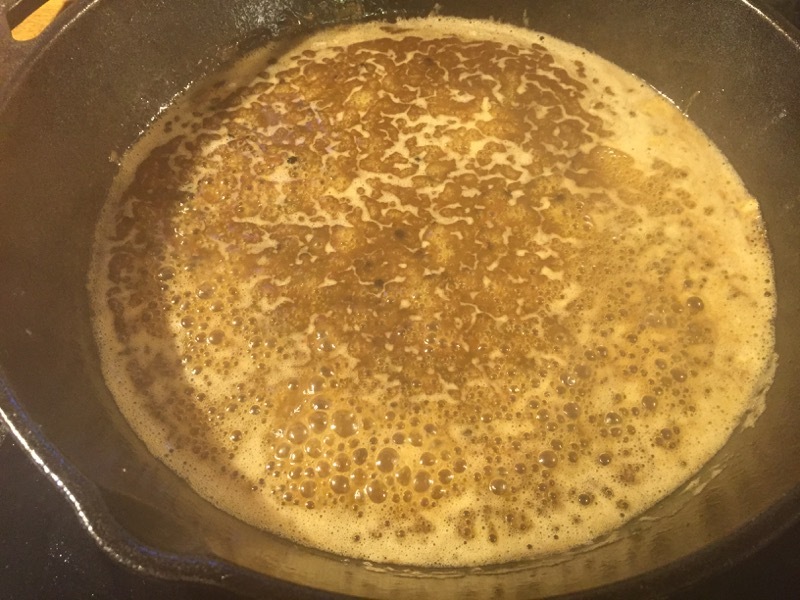 Then, remove the steaks and let them rest a few minutes, add cognac and meat glaze to the pan, and whisk it into a sauce. 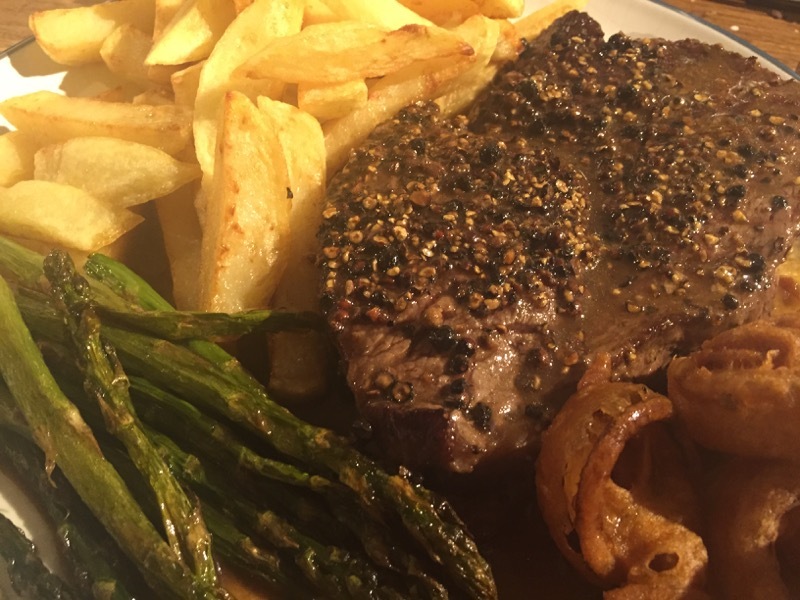 I served the steaks with chips (naturally), roasted asparagus (it’s in season, get it while you can), onion rings (who doesn’t love onion rings with steak and chips? ), and the sauce poured over the steak. Well, steak is delicious. This steak was, I’m sure, delicious too, except the steak was smothered in peppercorns which completely swamped any flavour the steak might have had. Don’t get me wrong, I like peppercorns, but here they were just a bit too much. I think I’d rather just have a nice piece of steak and add a little ground pepper to taste. As it was, the pepper completely dominated. So, all in all, not a great success. It wasn’t terrible, by any means, but not a great way to use a good piece of steak. I doubt I’ll be making this one again. The onion rings were great though. Some of the recipes in this classic cook book have really held up well over time. They are delicious and they still appeal to a modern palate. But some of them do not hold up well. And I’m afraid Steak au Poivre is one of them. I love steak. But I want to taste the steak. I like a creamy peppercorn sauce with steak, but I want to still be able to taste the steak. Sadly, with this recipe, I could not taste much of anything other than the extremely overpowering pepper. If the pepper were just in the sauce it would be easy to just leave most of it. 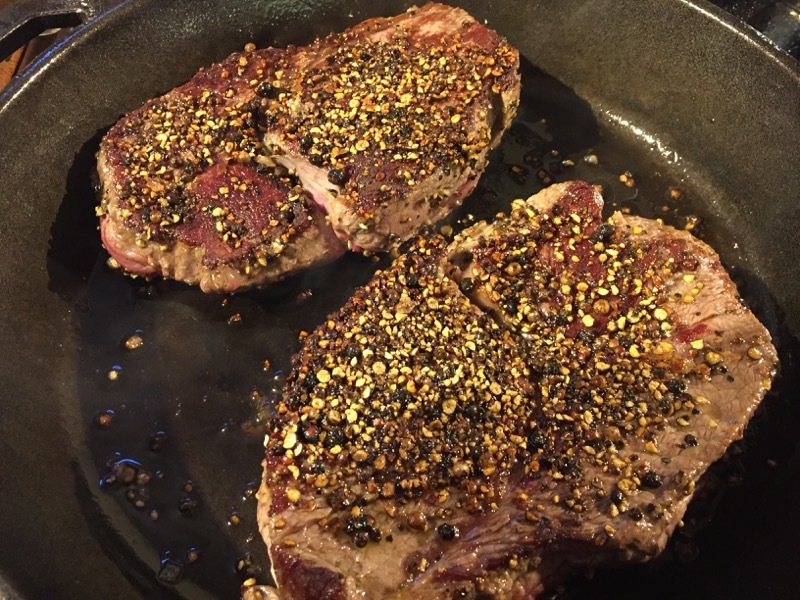 But the steak is encrusted with the cracked peppercorns, I mean thickly encrusted. And then it’s fried so that the pepper forms a crust on the meat. The first mouthful was a surprise. The second and third mouthfuls were challenging and then I had to start trying to scrape the pepper crust off the meat. I managed to remove some of it, but because it was fried onto the meat it had stuck pretty well. I imagine that in the 1960’s (the heyday of this dish) people were so unused to spicy food that this was a sort of right of passage. A bit like a vinda loo is now to youngsters eager to prove to their friends that they are not going to be beaten by a few chillies. I have no desire to “prove” anything when I eat my dinner. So this dish was very much not for me. I didn’t like it and I would never order it. Waste of a good steak if you ask me. It does seem like a touch too many peppercorns for my liking. I’d rate this dish a 5/10, and that is perhaps erring on the side of generosity.